Manufactuers and Suppliers of Supermarket Racks, Wall Racks, Display Racks, Supermarket End Racks, Heavy Duty Racks, Supermarket Shelving System, Wall Mounted Racks and Pegboard Racks from Chennai, Tamilnadu, India. 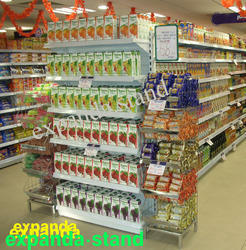 We Expanda Stand brings out to you the unique, modular and structured Supermarket Racks shelving system which are manufactured out of unparalleled automatic shelving production line which enhances the productivity, accuracy, reliability and repeatability at an affordable price. 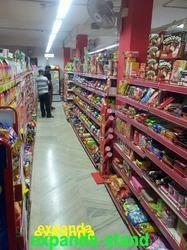 We are the Leading Manufacture and supplier of Retails Display Racks. The innovative range of Retail Display Racks manufactured and supplied by us are used as display shelves in stores and supermarkets. These racks are suited both for areas with small floor space of a few square meter or large floor spaces of the very extensive markets. Notable for their sturdy construction, durability, precise finish, large shelf space and ease of accessibility, these racks are highly functional, simple and can be easily assembled or dismantled. These racks are duly zinc passivated powder coated for providing resistance against corrosion. 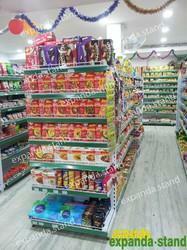 We are the Leading Manufacturer and Supplier of Grocery Store Display Racks in Chennai. Display Racks offeredcome in stainless steel round pipe frame finish as well as with multiple shelf options to pick from. Finding use in schools, homes, libraries, shop and other similar places, these racks come with durable castor wheel support for easy and convenient movement support. Some of its features include smooth polished overall presentation; available in different finish styles; made using superior material so as to provide for the durable and flawless finish; can be made available in different design choices a required by customers. Expanda Supermarket Shelving System and stand’s shelving system features high tensile steel uprights that are slotted with 50mm pitch provide convenient placement of shelves and other accessories at ease. Built-in leveling screws and modularity makes it easy to assemble within short span of time while yielding an unprecedented load capacity. 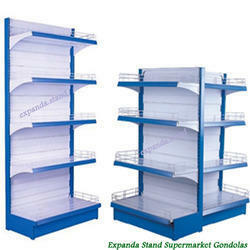 Expanda stand shelves are featured with double bottom box stiffeners that are mounted on ribbed brackets ensuring higher load bearing capacity with lesser thickness of sheet and thereby making it cost effective. The shelves are also provided with front and rear perforations for every 10mm that permits user to effectively use the divider system for the merchandises. The profiled shelves permit mounting of price label holders/data strips and also another shelf merchandising system directly onto the shelf to merchandise the merchandises resulting in higher sales productivity by improving product presentation making it easier to identify the stock items and allow customer purchase selection.